We've heard a little bit about Pixar's new film, Inside Out, opening in the U.S. on June 19, 2015. Pete Docter (Monsters, Inc., Up) will direct this whimsical journey into a young girl's mind where all her emotions play out: Joy (Amy Poehler), Fear (Bill Hader), Anger (Lewis Black), Disgust (Mindy Kaling) and Sadness (Phyllis Smith). There's considerable talent attached to this project--and it's an original project, not a sequel. I am seriously excited about this film. What we haven't heard as much about yet is the short film that will precede Inside Out in theaters. 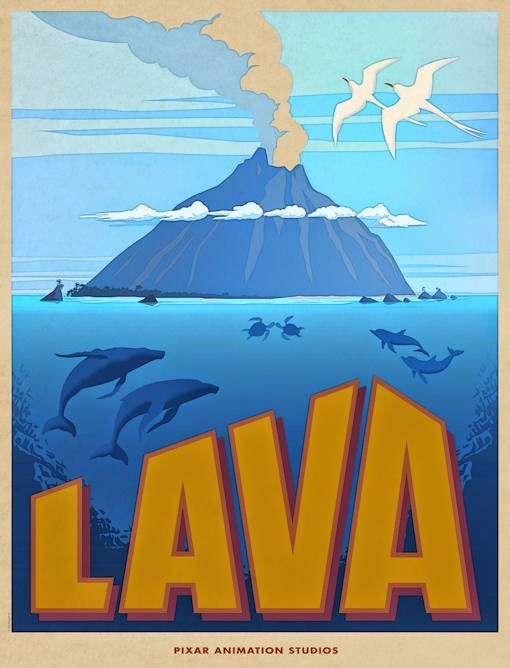 Disney/Pixar has now confirmed it's called Lava, it will be set on a volcanic tropical island, and it will be a "musical love story that takes place over millions of years." Here's the poster for Lava. Note the erupting volcano. Note the playfully paired up sea and air creatures. This one looks fun. Lava will be directed by James Ford Murphy and produced by Andrea Warren.